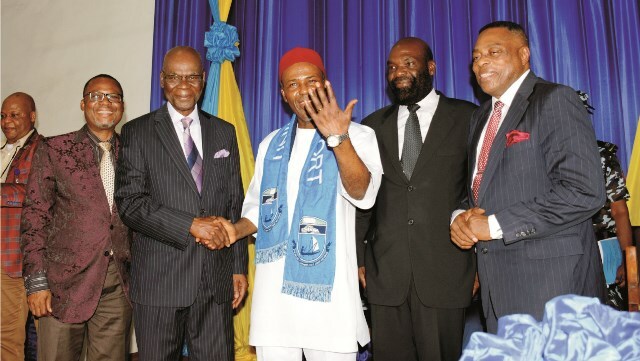 L-R: Vice Chancellor, University of Port Harcourt, Prof. Ndowa Sunday Lale, 2nd Vice Chancellor, University of Port Harcourt, Prof. Sylvanus Cookey; Minister of Science and Technology, Dr Ogbonnaya Onu, Pro Vice Chancellor, University of Port Harcourt, Prof. Mvendaga Jibo and 5th Vice Chancellor, University of Port Harcourt, Emeritus, Prof Nimi Dimkpa Briggs, during the 32nd convocation lecture delivered by the Minister of Science and Technology at University of Port Harcourt, yesterday. 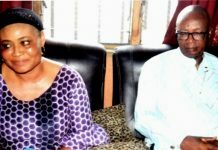 Ahead of the supplementary election scheduled for April 13, in Rivers State, the Conference of Nigeria Political Parties (CNPP) has called on the Independent National Electoral Commission (INEC), and the judiciary to frustrate the efforts of desperate politicians to disrupt the conclusion of the electoral process. The CNPP urged both the judiciary and INEC to ensure that the will of the people prevailed and that the ballot is not tampered with. 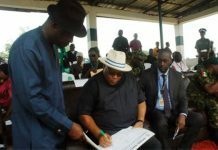 In a statement signed by its Secretary General, Chief Willy Ezugwu and made available to The Tide in Port Harcourt, the CNPP also urged the electoral umpire to ensure that the will of the people prevailed in states where the governorship election result was yet to be declared. The body frowned at what it described as “A disappointing decimation of the principles of democratic elections” after the 2019 general elections. According to the CNPP: “The judiciary to live up to its responsibility of ensuring stability at a time of electoral chaos deliberately orchestrated politicians in their greed for power for the purpose of selfish allocation of the people’s commonwealth. “Every election year in Nigeria, we have always returned to the same thing, a major violation of essential elements of democratic elections. “Even though the electoral umpire, the Independent National Electoral Commission (INEC), manages to make available a relatively accurate voters register and delineates the polling units, when it comes to ensuring that the ballots counted reflect the votes cast as the sovereign will of the people, we fail.